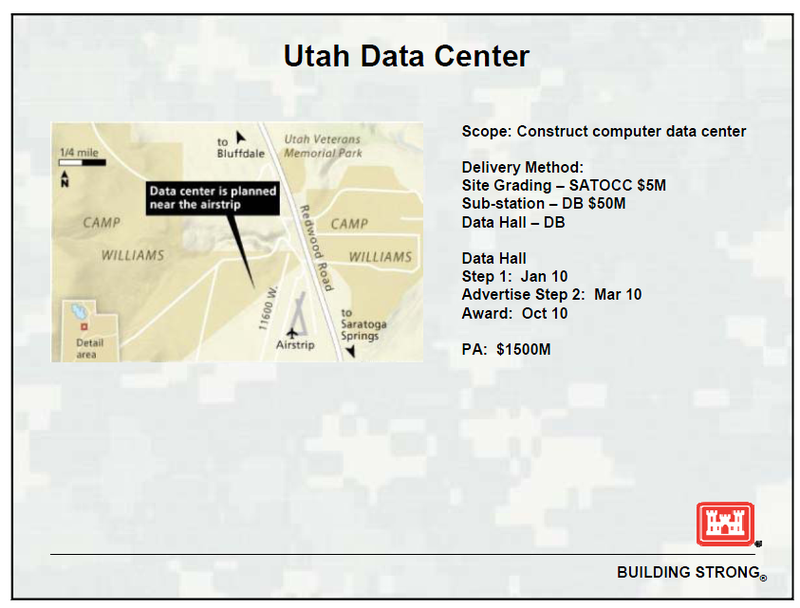 The Utah Data Center (UDC) will be a highly secure 65 Mega Watt, Tier III National Security Agency datacenter facility to be located near Camp Williams, Utah. The fast-track program will consist of approximately 1 million square feet of new facilities, of which 100,000 ft2 will be mission-critical space with raised flooring, and the other 900,000 ft2 will be devoted to technical support and administrative space. Ancillary support facilities include water treatment facilities, electrical substations, a vehicle inspection facility and visitor control center, perimeter site security measures, fuel storage, chiller plants and fire suppression systems. The UDC will incorporate green building strategies and will be required to be a LEED certified facility, with the goal of obtaining a LEED Silver rating. The construction of the facility has been broken into three phases. Construct 30 MW technical load data center to include modular structural components, finished flooring (both raised and administrative), ceiling, lighting, electrical, generators and associated air pollution control systems, mechanical, ventilation, and fire suppression. Also, these funds will provide utilities to include building electrical service, chilled water systems, communications, water, sanitary sewer and storm water management. Installed infrastructure will support 65MW technical load data center capacity for future expandability. The design is to be capable of Tier 3 reliability. Power density will be appropriate for current state-of-the- art high-performance computing devices and associated hardware architecture. U.S. Government and local support services will be provided. Security measures for this project include, but are not limited to a Visitor Control Center provided for data center personnel which is separate from the interim Visitor Control Center for construction personnel; perimeter security; and access control facilities. Physical and technical security of the construction site will be assured. This project will be designed in accordance with the Uniform Federal Accessibility Standards (UFAS)/Americans with Disabilities Act (ADA) Accessibility Guidelines, Antiterrorism Force Protection (ATFP) standards and Unified Facilities Criteria (UFC) design standards. PROJECT: Construct a 30 MW technical load data center and infrastructure for 65MW technical load data center capacity. (a) Facility design goal will be to the highest LEED standard attainable within available resources and will include: sustainable site characteristics, water and energy efficiency, materials and resources criteria, and indoor environmental quality. (a) Data center technical load of 30 MW distributed across raised floor are the design parameters for the facility. (b) The infrastructure support and administrative areas will be designed to support state-of-the-art high-performance computing devices and associated hardware architecture. (d) Enhancements to the building for IT and security include construction as a sensitive compartmented information facility (SCIF), as well as, requirements related to Antiterrorism Force Protection (ATFP). (a) Technical load will be distributed across the data center areas. (b) Seismic considerations are to be made in the facility design. (d) Facility command and control contained in a central modular office component. (e) Facility will have a loading dock with vehicle bays, three (3) of which are to be equipped with dock levelers sized to handle tractor trailers. (a) Technical load capacity is 30 MW with loads distributed evenly across the data center areas. (c) Dedicated substation for each critical UPS. (d) UPS and generator backup for facility systems. (e) Generators will include Selective Catalytic Reduction (SCR) pollution control equipment, chemical storage tanks and feed system. (a) Chilled water system to support both air and water cooled equipment. (b) Each data center area is to have air cooled and water cooled equipment with Computer Room Air Handlers (CRAHs) located external to the raised floor area. The piping headers / systems are to be designed to accommodate future expansion. (c) Back-up capability for mechanical equipment. (e) Air distribution redundancy for CRAHs. (f) Fire Protection – Double interlocked pre-action fire protection system for all electrical and mechanical support spaces. (g) Wet pipe for administrative and raised floor areas per DOD standards. Information on Phases 2 and 3 is welcome. In November 2009, the U.S. Army Corps of Engineers held two “Industry Days” for potential contractors interested in bidding on Utah Data Center contracts. The following two lists include the complete names, address, and contact information of all attendees to these events. A briefing given at these events is also available. Utah Data Center Industry Day 1 Attendee List, November 5, 2009. Utah Data Center Industry Day 2 Attendee List, November 14, 2009. Overview of Camp Williams site. UDC will be located on the west side of the highway, on what was previously an airfield. Layout of the UDC at Camp Williams. Site layout from a U.S. Army Corps of Engineers brief. 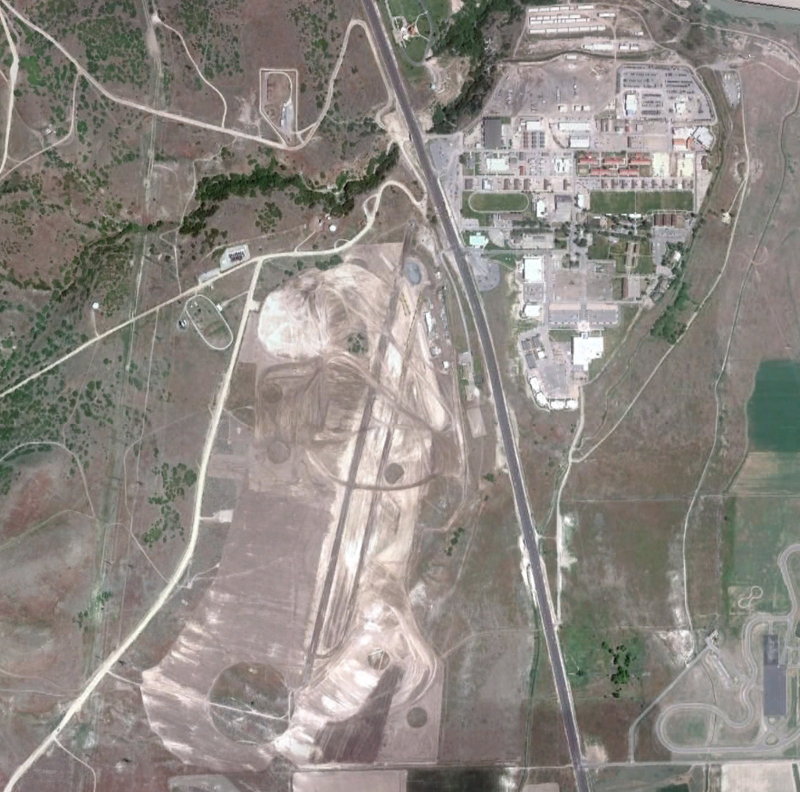 Utah Data Center site prior to construction. Construction activity at the site, photo from June 2010. Vehicles at the construction site. Northern portion of the site. Notice the long black cable running from the side of the road, as well as the beginnings of fencing. Conceptual layout of data halls to be constructed in UDC. The following ten videos were released by the FBI in relation to their investigation of the so-called “Illegals Program”, a network of accused Russian spies operating unofficially in the U.S. from the late 1990s to 2010. 20 Mainand St.John Street, New Amsterdam,Berbice, Guyana.